When butter is mostly melted, stir in milk, and heat mixture to 100-110 F.
Meanwhile, add yeast and honey to the bowl of a stand mixer fitted with a paddle attachment (or a large mixing bowl if mixing by hand). When milk mixture is at temperature, add to yeast and honey; stir to combine. Add salt and egg, and stir until combined. Stir in 2 ½ cups of flour. Add remaining flour until dough clings to paddle and cleans the sides of the bowl. Switch to the dough hook, and knead for 2 minutes (or by hand for about 5 minutes). While dough it kneading, stir together granulated sugar and cinnamon in a wide, shallow dish. Roll piece of dough into rope 8 inches long. Dip in butter, and then roll in cinnamon-sugar mixture. Tie dough into knots, and place dough on prepared baking sheet. If you’d like a how-to on shaping the knots, check out the video just above the recipe. Cover, and let dough rest for 10 minutes. Preheat oven to 400 Line a 9×13-inch rimmed cookie sheet with parchment paper or a silicone baking liner. Set aside. Bake for about 9-12 minutes, or until lightly golden brown. While the knots are baking, prepare the icing. Stir together melted butter, powdered sugar, and vanilla. Add 1 tablespoon milk, and stir in. Continue adding milk until icing reaches desired consistency. I use about 1 1/2-2 tablespoons for a thicker icing. Remove knots from oven, and let cool for 5-10 minutes. Drizzle icing over knots, and serve warm. Although this recipe is definitely not one for the beginner baker, the experience was enjoyable and pleasantly rewarding. 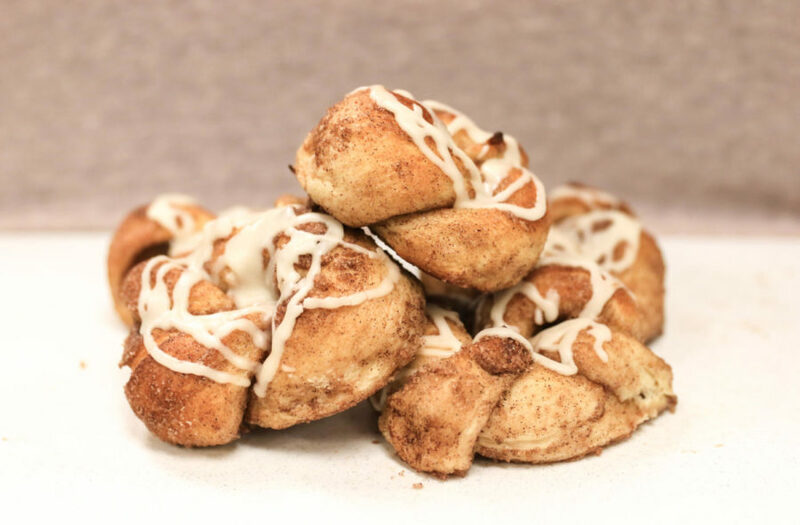 These cinnamon sugar knots are tasty and economically accessible as well due to the simplicity of the ingredients and the lack thereof. You may even find all of these material at your nearest CVS. The time is also another lovable aspect of this recipe because prep and baking will only take an hour max. I would highly recommend trying out this for dessert or even for breakfast.